A few weeks ago I went skiing in the rain and got my gloves completely soaked. Three days later after drying indoors they were still wet, and blowing air into them with a fan overnight made little difference. I had been thinking of making a glove-drying device for some time, which would have a pipe to deliver hot air to the palms and a return pipe to allow free circulation. A prototype of this using a hair dryer dried the glove palms satisfactorily but left the fingers wet. The hollow hand design described here dried my gloves in about three hours. It uses positive pressure to deliver warm air to each fingertip in the glove, with air return around the outside of the hand. 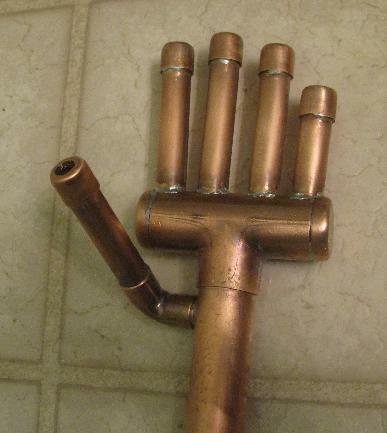 The hand is made of standard copper plumbing pipe and fittings, half-inch diameter for the fingers and one inch for the wrist. 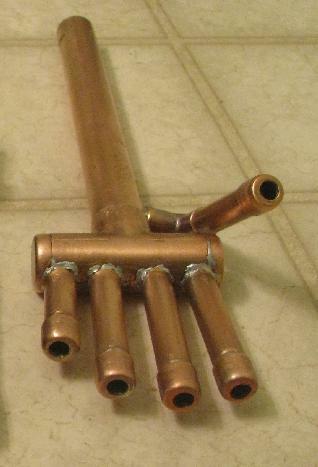 The joints are all soldered, except that the thumb joint is left free to rotate so that the hand can be used on both right and left-hand gloves. The hollow hand showing fingertip vents.